Oregon City beaver removal is a service we provide to solve beaver damage problems on properties. When you have beaver living in a body of water near your house it is very likely you will have fallen trees as well as flooding problems. 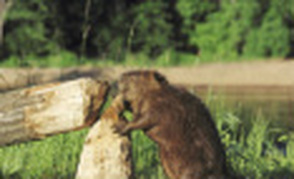 We have been solve beaver removal problems in Oregon for over 30 years and have become the experts. When handling a beaver damage problem you should have a professional take care of it because it can be very difficult. We are able to provide Oregon City beaver trapping when you have a beaver damaging your property or creating some kind of a problem. The two most common call we get are for tree damage or flooding problems in Oregon City. We have different beaver control methods that we can use to handle any problem. When you have a beaver dam on your property and the beaver have been removed, by removing the dam it can make the area not as appealing to other beaver. So by having your beaver dam removed it can help prevent future beaver from moving in. Depending on the size and location of the dam, equipment might be needed to solve the problem, but most can be done by hand.